The club was formed in 1904 and for the first year of their existence, they were known as Pilton Yeo Vale. Members of the North Devon League upon formation, they were champions twice before moving on to the Exeter & District League. After becoming champions of that league in 1947, Barnstaple Town joined the Western League. Starting in its second tier, which they would go on to win three times. Finished ranged from the club twice being Western League champions in 1953 and 1980 to a low of 15th in Division 1, back in 1960. As recently as 2015 the club was in the step 6 Western D1 but they were champions that year. 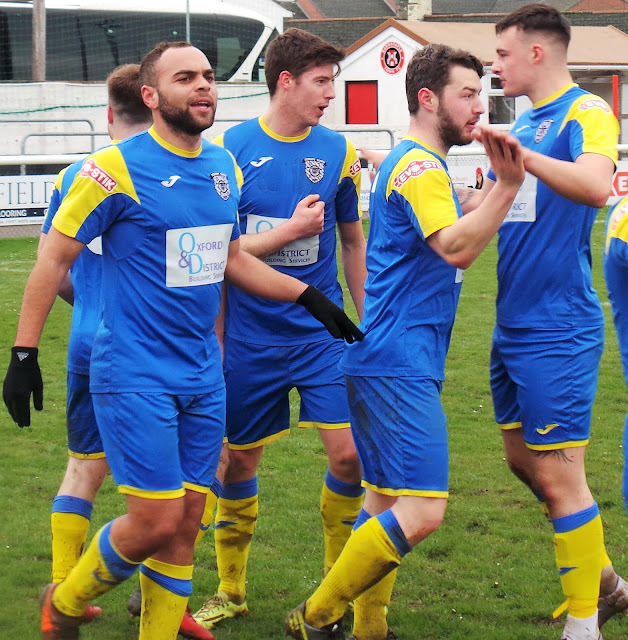 They followed that up with a runners-up spot in the Premier Division in 2016 - this was sufficient for promotion to the Southern League D1 West as champions Odd Down did not apply to go up. 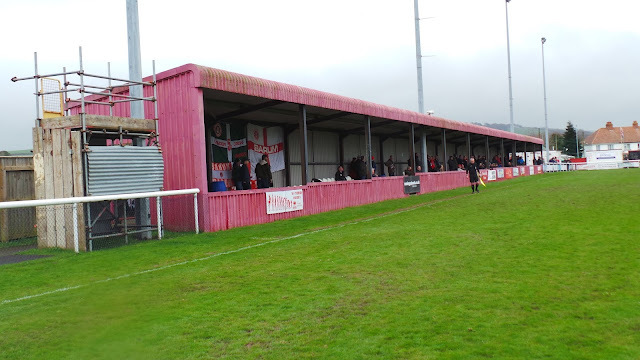 Last season saw a steady but unspectacular 17th place finish in their debut season at step 4. This season sees them currently sitting a couple of places lower, but well on course for survival. 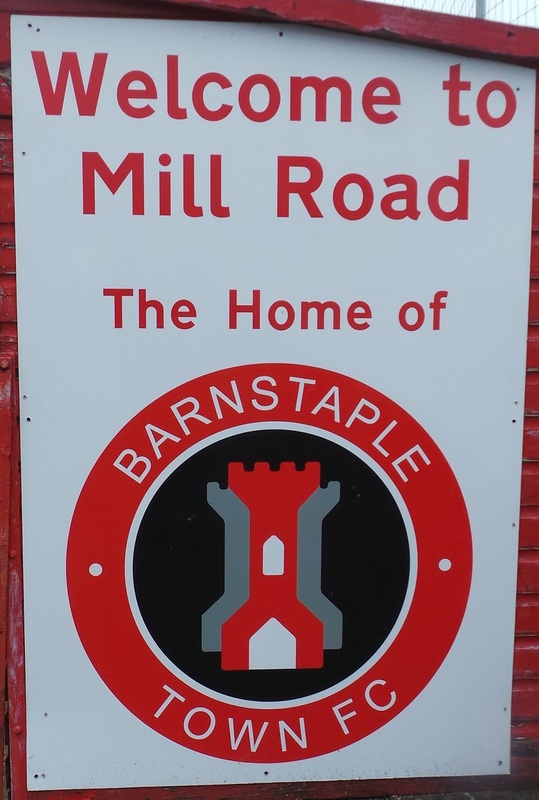 Barnstaple Town have reached the FA Cup 1st Round on four occasions, losing 5-2 after a replay to Folkestone in 1951 and 2-0 to another non-league side in Bilston in 1972. They've faced Football League opposition twice, firstly in 1954 when they lost 2-1 to Bournemouth & Boscombe Athletic which brought about their record attendance of 6,200 and then again in 1959 when they suffered a 4-0 defeat at fellow Devon side Exeter City. 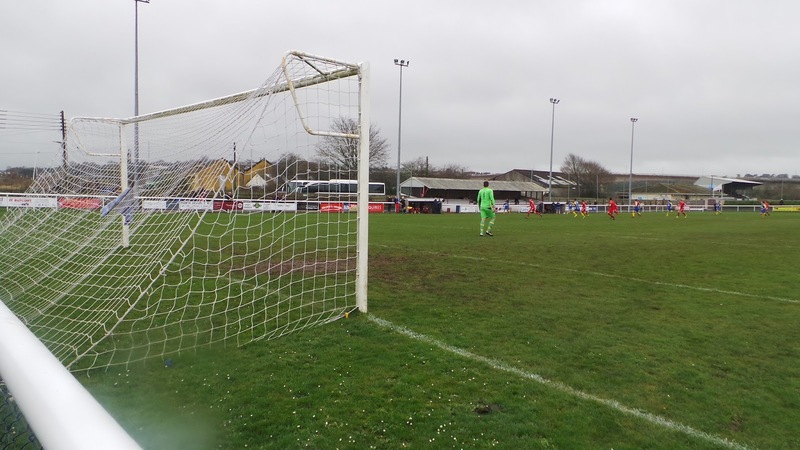 in 1972, the club enjoyed a good run to the FA Trophy 2nd Round, beating Bodmin Town, Taunton Town, Bath City and Kings Lynn before a 2-0 defeat at Bexley United. 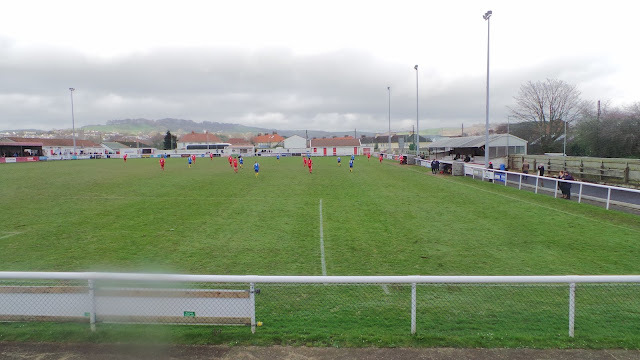 The FA Vase 4th Round was reached in 1995 when Barnstaple lost 2-0 at home to eventual winners Arlesey Town. Local honours include the Devon Pro Cup on thirteen occasions and the Devon St Lukes Cup in 1988. 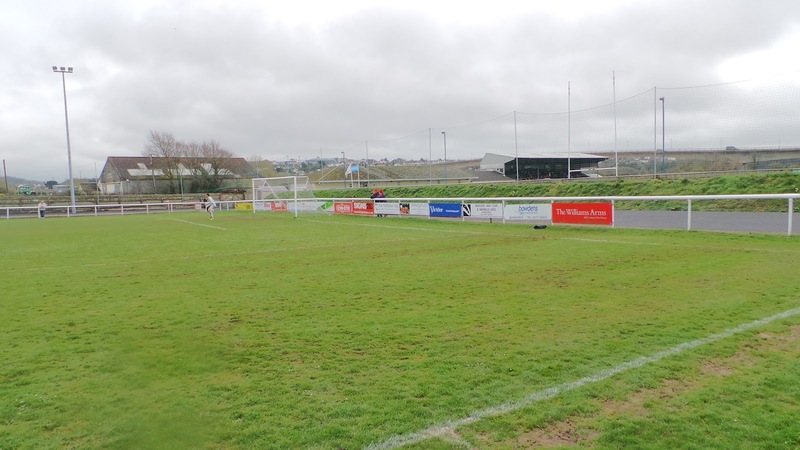 The club's biggest win of 12-1 over Tavistock came in 1954 whilst the unwanted record of biggest defeat occurred as recently as 2013 as Odd Down beat them 11-0. Once again I was on my own this Saturday, owing to fellow hoppers being elsewhere. I had three favoured options - something on the train in London or staying away on Friday and doing a few games across two days. However, it was the third option that I went for, namely going on the Didcot Town coach to Barnstaple. I'd been visiting Western grounds using this method, paying a tenner to get to Tiverton on the Kings Langley team coach and then getting to Taunton Town for free with the Kidlington team last Saturday. 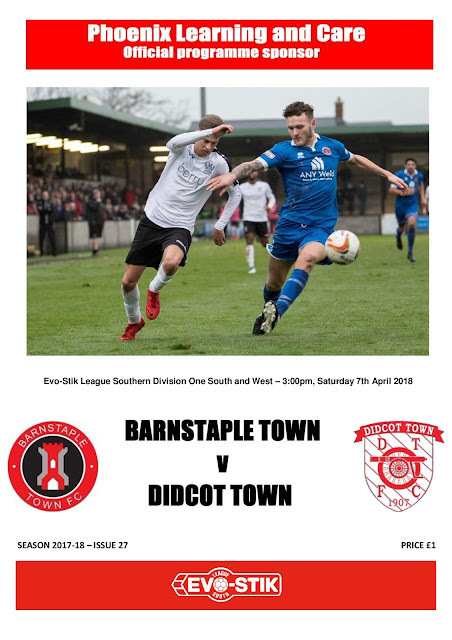 Didcot were asking £20 for their coach to Barnstaple, but that was still great value as it would cost over twice that in petrol. The weather was looking like it wouldn't be causing an issue, so I provisionally put plans in place. 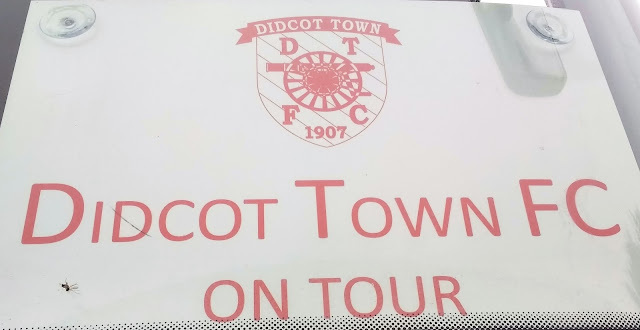 The only dampener was that Didcot were not taking pre-bookings and spare places were first come, first served. 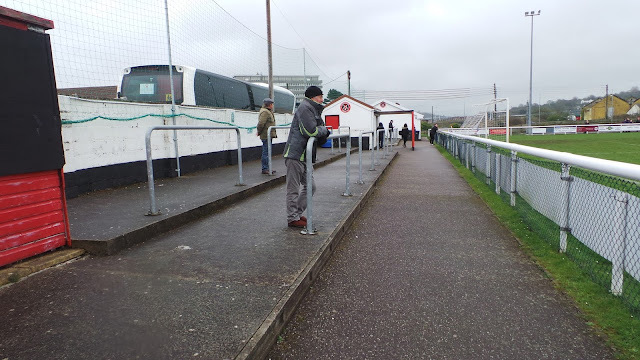 and although I was assured that coaches were not normally full for league games, I'd be sure to try and get there early. Just in case, I did devise a backup plan of a couple of games in Bristol, but I was hoping that I wouldn't need it. I woke at 7 am on the day of the game after a better night’s sleep than usual. After having some breakfast and getting dressed, I caught up online before leaving at 8.30. My progress was halted because of Thames Water digging up Amersham Hill and then leaving behind a malfunctioning set of traffic lights. In the end, I turned around and went a different way, arriving at Didcot around 9.25. There was some daft permit scheme in force in the car park, so instead of chancing it, I parked outside in the street as the regulations were not that clear. I was happy to get a seat on the bus and even got a double seat as barely anyone turned up. I learned that the coach cost £600 to hire and I was glad that my bargain £20 fare helped out even a tiny bit. It was raining on the way down and a few games had been called off already. There appeared to be no such problems down in Barnstaple with the weather forecast to be dry. We had a stop at Taunton services which were as dull as any other service station, with me just wanting to get to Barnstaple for a couple of pre-match pints. We got to the ground at 1.30. My first stop was Wetherspoons number 159. The Water Gate was well above average and I was happy to sample a pint of one of my favourite ciders, Black Dragon. There were 7 in total, plus bottles. 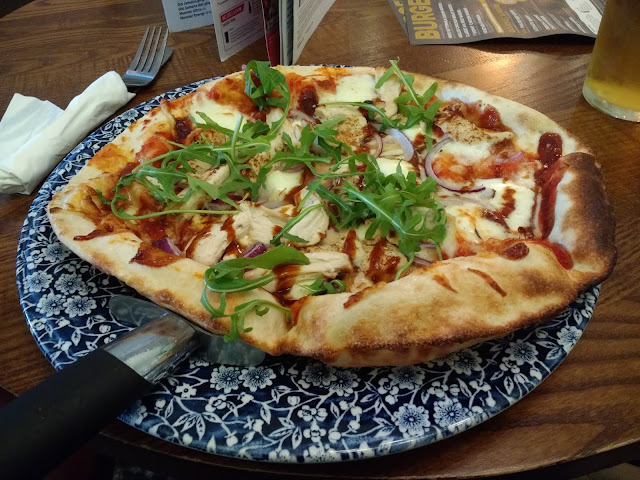 Wetherspoons 160, Panniers was not as good, not nearly so much choice of cider so I had a BBQ Chicken Pizza with Thatchers Gold for £7.49. The pizza was surprisingly good, fresh dough and far better than the crap you get in supermarkets or at pizza chains. A couple of fellow hoppers questioned how good it could be, despite probably never having one, but for me, it was one of the better ones that I have had. From there I made my way to a place I had found by chance when looking for stockists of a local cider that I wanted to try. 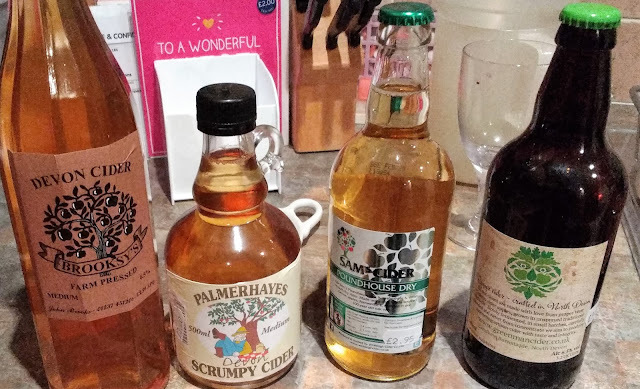 The South West Cheese Shop had a huge range of ciders, more than I could possibly carry. So I picked 4 of the best bottles and walked back towards the ground. It had been a smashing little place, with a band playing in the town centre and a river nearby. In fact, I wished I’d had more than 90 minutes with me getting back to the ground bang on kick off. I paid £8 to get in, plus £1 for a decent programme. 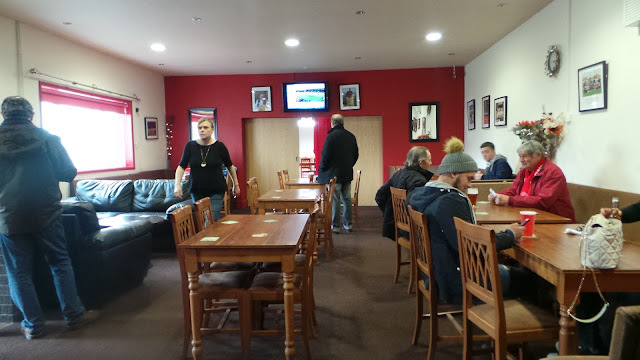 I took a look in the bar at halftime and as I’d had both the Thatchers ciders on offer many times before, so I didn’t indulge. Visitors Didcot started well and were ahead within a couple of minutes when George Jeacock headed home Morgan Williams’ corner at the far post. Less than ten minutes in, the lead was doubled when Sam Barder latched onto an attack from the right, rounded the keeper and finished from a tight angle to make it 2-0. 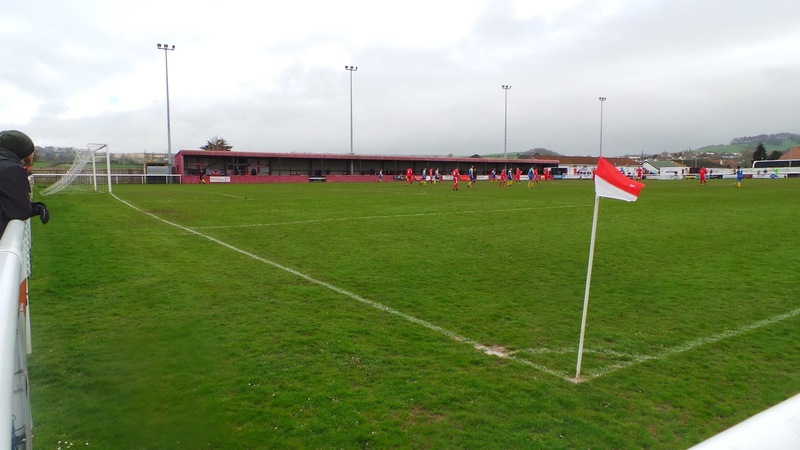 It had been a sloppy start from Barnstaple and although there were plenty of cheers and joy coming in for the home side, they were for the rugby club who play adjacent to the football ground and were making light work of their opponents. It was 3-0 on 24 minutes when Morgan Williams headed home a cross from the right. Didcot continued to impress but it remained 3-0 at the break. 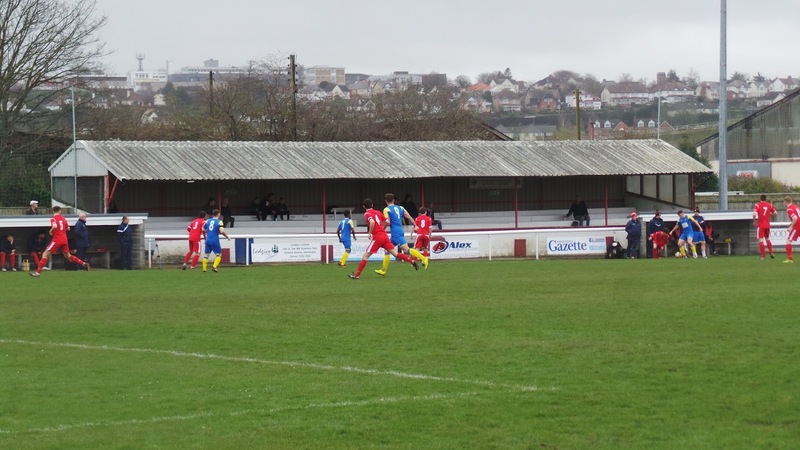 Barnstaple’s questionable defending had been the undoing of them in the first period and they were caught out again around ten minutes into the second half. This time Louis Joyce was on hand to profit after the hosts failed to clear properly after a goalmouth scramble and it was 4-0 to Didcot. From then on, the visitors took their foot off of the gas and it was Barnstaple who came closest to scoring when they hit the bar and forced a good save from visiting keeper Leigh Bedwell. Both sides had good shouts for a penalty but the referee was not obliging and there were no further goals. It was a bit one sided to the disappointment of the majority of the 110 crowd. I had time to kill after the game so jogged into town to see if I could find a Co-Op. There was not one where Google Maps said it was, but it didn’t really bother me as I already had some drinks for later. I got back to the ground at 5.15 and had to wait around half an hour for the team to emerge. They were elated and had their music on at the back of the bus, along with some cans of Carlsberg. I was in a great mood too, the day had provided everything I’d wanted it to and then some. I was waiting for the football phone-ins but both sports stations had coverage of the Manchester derby. City absolutely destroyed United in the first half and would soon be crowned worthy champions. Or so I thought when they could have been 6-0 up at halftime. It was only 2-0 though and United mounted an unlikely comeback to lead 3-2. We stopped at services for a quick toilet stop, although the players got McDonald's which meant we stopped for around half an hour. Unlike Accrington Stanley who have been in the news recently for getting it as a win bonus, they had to pay for themselves. At least the long journey gave me time to type my blog and put in place plans for Tuesday. 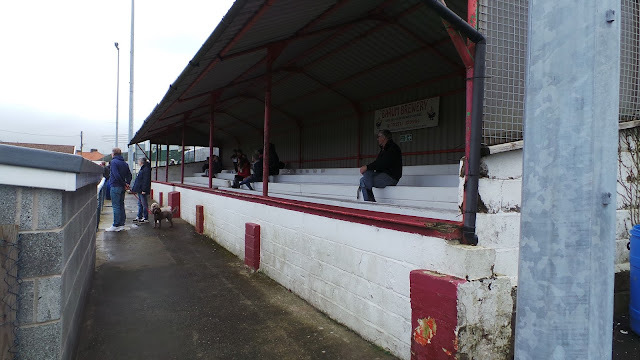 As things stand, I’ll be heading to Cadbury Athletic v Ilkeston Town for ground number 765. There was a brief stop at Membury services as the toilet on the coach was out of action. We eventually got back to the ground at 9.25 with me getting back home at 10.10. I had a couple of drinks with Match of the Day, going to bed just after midnight despite being up for work at 5 am. MILL ROAD is a decent step 4 ground. 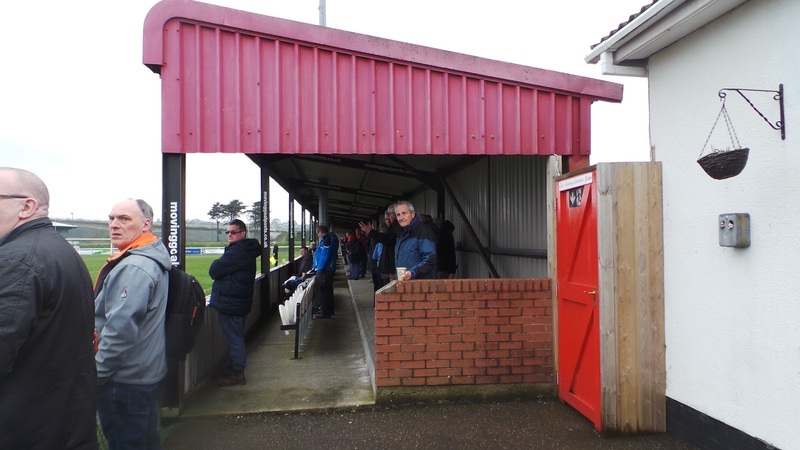 There are two covered areas, one smaller stand holding around 200, plus a longer area on the other side with a combination of terrace and seats that holds 1000. 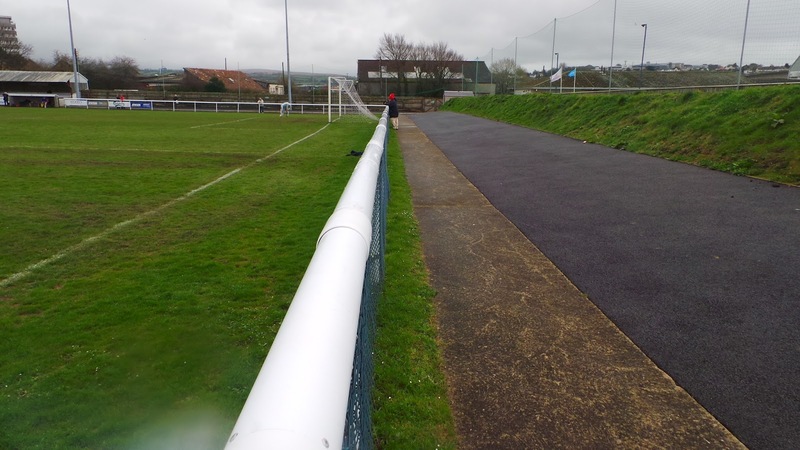 In addition, there are some open steps of terracing behind the near goal and flat standing around the rest of the ground. A grass bank at the far end offers an elevated view of the action. 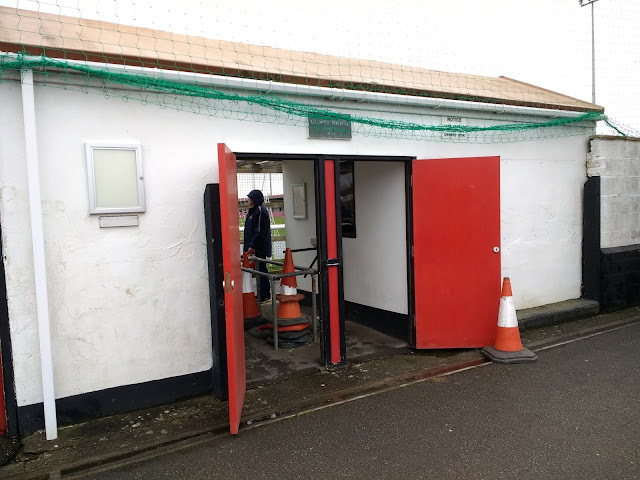 There is no club shop at the ground, only online. The programme is one of the better ones that I’ve seen this season with a decent amount to read. 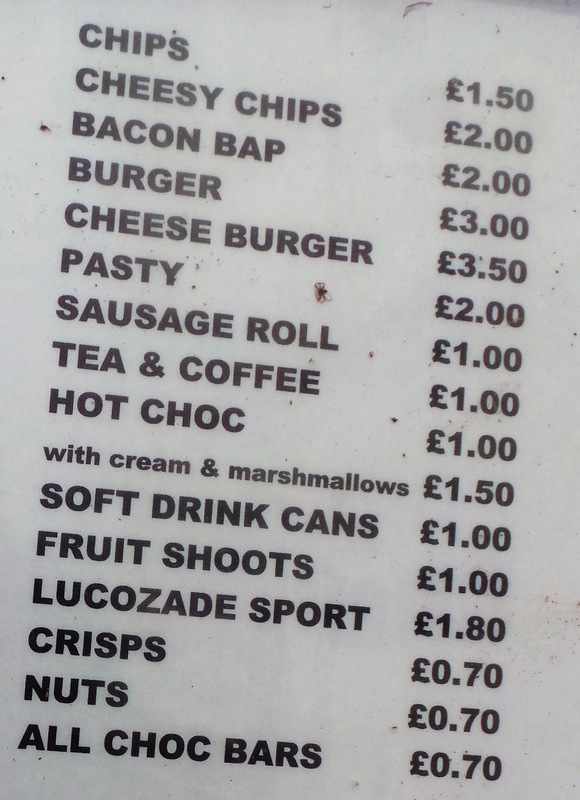 Food and drink wise, the facilities at the ground appear decent without being exceptional. There’s plenty of choice in town, with two Wetherspoons pubs. The better of these is the Water Gate and this is well worth a visit if you have time. Nearer the ground is a decent canal side pub which also does food and although I didn’t call in, it appeared to be decent.